Only acceptable calculator for using while taking the online GED test. Four-line display, One- and two-variable statistics, MathPrint™ feature, Fraction/decimal conversion, Step-by-step fraction simplification, Edit, Cut and Paste entries, Solar and battery powered. 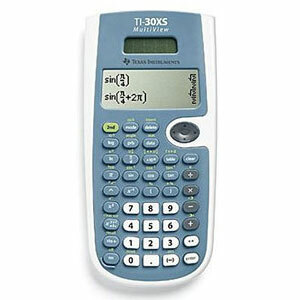 Exam acceptance The TI-30XS MultiView™ scientific calculator is approved for use on SAT*, ACT*, and AP* and the online GED exams. Ideal For: General math, Pre-Algebra, Algebra 1 and 2, Geometry, Statistics, General Science, Biology, Chemistry.